This Deuan Tem Salitul movie page contains 6 records. Teewa (Witoon Karuna) is a photographer and writer. He is also a butterfly hopping from one woman to another (น้ำผึ้งดวงตา) such as Tuk. He is sweet talker (ปากตรงกับหัวใจเสมอ). It is lust (ความใคร่) before real love (ความรัก). He meets one of his books fan called Rat (Nantana Ngao Krajang) at the party. They get on well but she asks more time to be ready as Teewa was heading directly to a motel. Romantic scenes with Teewa and Rat are shot partially in Ancient City (เมืองโบราณ). Rat's friends warn her about Teewa (เจ้าชู้ที่สุด). Rat's father wishes to send her to America to study. Separation is very difficult (ไม่อยากห่างคุณ). Rat needs to study four years. They see each other a last time in Ayutthaya, symbol of eternal love (เจ้าฟ้ากุ้ง). They promise to wait each other. Teewa has opportunity to go to America for business trip but he is not able to find Rat as she changed address. He doesn't receive news anymore. Teewa starts to indulge in alcohol and finally quits his job. Teewa has a car accident. Tuk gives her blood to save him. They marry and have a child. Four years have passed. Rat finally comes back and contacts Teewa. She also married in America with a fellow Thai student and didn't dare to tell it to Teewa. It is painful (ทรมานใจ) to see other during social parties as love is still here. They secretly meet in Sukhothai. A difficult choice between love and society dictates has to be done. Teewa is thinking to divorce Tuk and marry Rat. Finally seeing their current families wrecking away, they decide it is wiser to stop their impossible love. Movie สองเรา (“two of us”) was released in 1979. 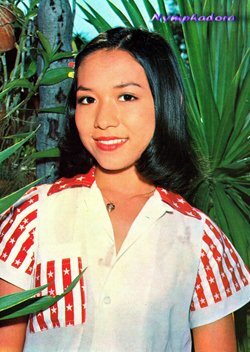 Same as character Rat, actress Nantana Ngao Krajang stopped her career in 1980 and went to America with her family.